Giving your closet versatility, the Sweetheart Crop Top is the perfect piece that can be worn from day to night. With its playful feminine heart print, this crop top features a sweetheart neckline, underwire cups, front button details, open back detail and puffy sleeves. Pictured with the Sweetheart Mini Skirt. Sizing: Due to oversized nature a size 0 would fit a 6-8, and size 2 would fit 10-12. The top is labelled a size IT44 but due to the elastic nature fits sizes 6 to 14. Looks great with either of the matching skirts – maxi or mini. Wear your heart on your sleeve. The Dominique Crop Top is an unapologetically feminine off-shoulder top with adjustable shoulder ties, an adjustable front drawstring and a smocked back. Pictured with Dominique Mini Skirt. Model is a 32B and is wearing a size small crop. The Louie Louie Top is a super sweet midriff baring cropped style. 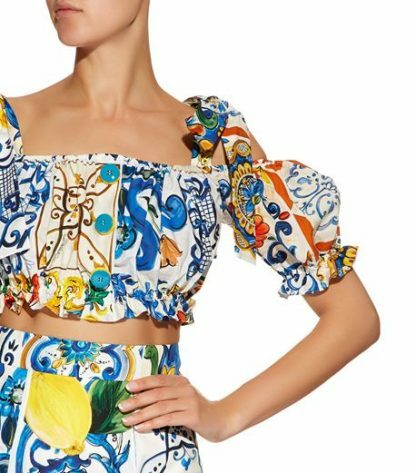 The top features dramatic puff sleeves that can be worn on or off the shoulder depending on the mood. The ruching on the bust of the top adds a subtle volume. Pair with a high waisted style & strappy summer sandals, or with the matching Secret Garden pant for a fun, Spring look! Show a little skin in the Sophie Velvet Floral Top. From its flattering strapless neckline to its structured boning, this gorgeous pansy velvet chiffon burnout crop top is complete with partial lining, grip tape and an exposed hook-and-eye closure. Pictured with the Sophie Velvet Floral Skirt. Mixed media madness. The St. Louis Crop is an adjustable wrap top with an asymmetrical sleeve that creates an effortless fallen-off-the-shoulder silhouette. Pictured with the St. Louis Mini Skirt. Whitewave Laced bodice top by Zimmermann. Long sleeve cropped bodice top with lace up cutout detail through centre. $149 rental - NOOKIE Belle High Waist Pant & Crop Top (Black) - RRP $348 Sleek high waisted pants, with a wide leg and split up the side seams. Made from a structured, form fitting woven polyester spandex. Xendeya Top by Eliya The Label. Inspired by the beauty of a Grecian summer, this top is fabricated from a textured bandage fabric in a stunning blue and metallic gold hue. It is fully lined with moulded cups to support the bust and is complete with an exposed metaluxe zip at the rear. Fit is true to your regular size - if you are between sizes we suggest the size up. Model wears the size 6 (size XS) and is 178cm tall (5'10''). Dolce Gabbana – Polka Dot Crop Top and pants. Top is stretchy and will fit multiple sizes. Pants have little to no stretch and fit a size 6 to 8. Mixed media madness. The St. Louis Crop is an adjustable wrap top with an asymmetrical sleeve that creates an effortless fallen-off-the-shoulder silhouette. Pair it with the St. Louis Mini Skirt. Irresistible for its feminine print and sultry details, the Dixie Ruffled Crop Top flaunts versatility with each wear. With its light and breathable cotton, this must-have gingham crop features mini ruffles and shirred puff sleeves complete with a back hook-and-eye tape closure. Match it with the Dorothy Ruffled Midi Skirt.